April 3, 2019 –Orange Beach, AL—Baldwin County drivers are enjoying the convenience of not having to stop to pay tolls on the Beach Express Bridge thanks to Alabama Toll-By-Plate. In May 2018, Beach Express implemented the video tolling option along the bridge, allowing drivers to pass through the toll plaza without stopping for a gate to rise. Using license plate recognition, customers with an Alabama Toll-By-Plate account can bypass the attended tollbooths and keep traffic flowing. 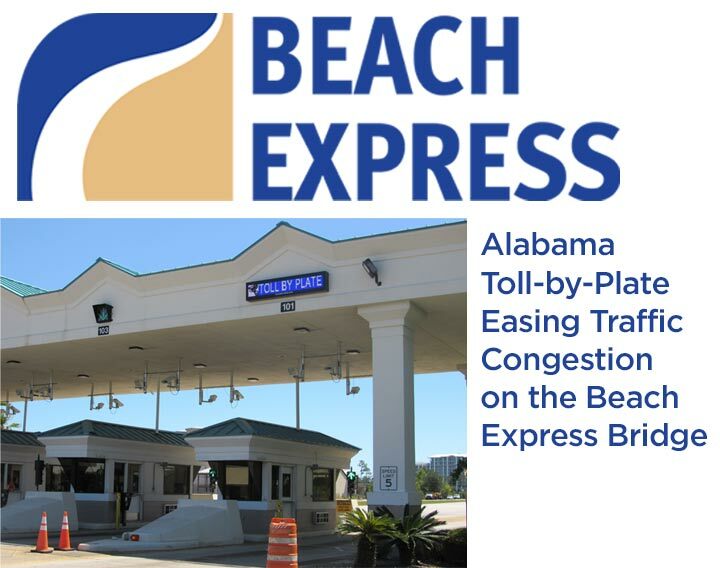 Beach Express President Neal Belitsky says the license plate tolling option has significantly helped decrease traffic congestion along the major thoroughfare between Foley, Gulf Shores and Orange Beach, Ala., particularly during the peak spring and summer travel months. “We are committed to expediting traffic and serving community needs, while taking care to minimize any interference with seasonal traffic,” said Belitsky. Drivers have five business days of their first Toll-By-Plate transaction to register online and pay the base toll. Toll-By-Plate registered users pay the base toll rate of $2.75 per use, plus $1.00 per each additional axle. Non-registered users pay a toll rate of $2.95, plus $1.00 each additional axle, and a $5.00 administrative fee on their first invoice. Registering with Alabama Toll-By-Plate is simple: set up an account at beachexpress.com or download the Alabama Toll-By-Plate mobile app and register online. Drivers can use Alabama Toll-By-Plate from any lane, but the outside lanes of the Beach Express are usually unattended and open to free flowing traffic. During periods of extremely high traffic, cash and credit card payments may be suspended and all traffic will be processed by Alabama Toll-By-Plate to ease congestion. For a complete listing of additional tolls and rates, visit the Beach Express website at beachexpress.com. American Roads, LLC is a privately-held American company that owns and operates toll road facilities in the United States and Canada. About 13,000,000 vehicles travel on the Company’s facilities each year. The Company’s mission is to provide its customers with safe and efficient road transport routes. With years of toll operations and maintenance experience, and a well-trained and dedicated staff, the Company strives to provide top quality service to all of its patrons. The Company currently operates the following four toll bridges in Alabama: Emerald Mountain Expressway in Wetumpka, Alabama; Montgomery Expressway in Millbrook, Alabama; Tuscaloosa Bypass in Tuscaloosa, Alabama; Beach Express in Orange Beach, Alabama; as well as an international border crossing tunnel between Detroit, Michigan and Windsor, Ontario.